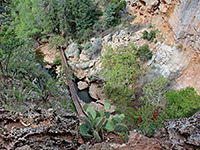 Steep hills and canyons make most of the wooded land towards the north of the Tonto National Forest quite inaccessible, and the few paved roads are rather winding and not conducive to speedy cross-country travel. 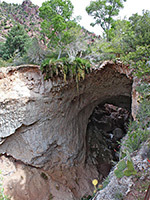 In one of the narrow V-shaped ravines that stem from the Mogollon Rim, a series of underground springs with mineral-laden waters have built up large deposits of travertine (calcium carbonate) through which Pine Creek, a year-round stream flowing through the canyon, has eroded a passageway leaving the rocks above standing a natural bridge. 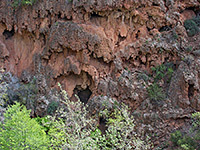 The formation has been protected as the Tonto Natural Bridge State Park since 1990. 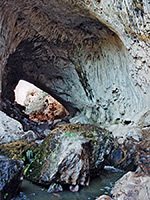 The natural bridge was discovered by David Gowan, a Scotsman, in 1877 while hiding from Apache Indians, and so impressed was he by the unusual, secluded location that he persuaded his family to emigrate and live there. 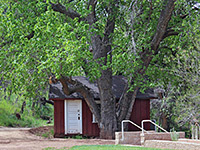 Although they left in 1948 their lodge remains - since being included in the National Register of historic places - and forms the centerpiece of the buildings in the state park, which is reached by a short, paved side road (FR 583) that forks off AZ 87 11 miles north of Payson - this crosses a plateau sparsely covered by wildflowers and small trees, then drops steeply 800 feet to the canyon floor. The bridge is not immediately apparent, as beyond the park buildings stretches a flat meadow that seems to cover all the ground between the canyon walls. The creek actually runs a hundred feet below in a narrow gorge, the edge of which is hidden by trees, flows under the bridge beneath the meadow and continues downstream through a rather wider canyon. Depending on which dimension is used as a measurement, Tonto is the world's largest travertine bridge - 180 feet high, 400 feet long and about 100 feet thick on top. - a route down the cliffs just below the bridge. This is quite steep and rather slippery in places but well worth the trip as it leads directly beneath, and in times of low water it is possible to walk through and link with the end of the Pine Creek Trail. 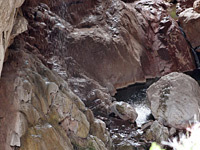 High above, a small waterfall cascades over the edge of the bridge with more trailing grasses and ferns. - a longer path alongside the west side of the creek to a viewpoint beneath the bridge, a good place to appreciate the stalactite-like formations that hang from beneath the bridge and adorn the west-facing canyon wall - aptly described as an 'outdoor cave' by the park brochure. This trail has recently been extended to link with another path above (the short Anna Mae Trail). - a very short path down into the canyon above the bridge to a grotto with hanging greenery, seeping water and travertine formations.